Spring has sprung and the team is feeling inspired – you could call it spring-spiration. To take advantage of the warmer weather, we explored the nearby sights, and tastes of the BIG world. A little field trip to St. Jacobs, Ontario ignited some ideas on day to night lighting, and a visit to a sugar shack in Georgetown, Ontario showed us first-hand the process of how this favourite sticky syrup is made – we can already smell our Québec destination coming to life. We also have a little look into the foundation of what holds up our miniature world. Keep reading for more on all this news! Day To Night – Oh, What A Sight! Imagine seeing the sun rise from behind our miniature Toronto skyscrapers as the city night transforms from a skyline blanketed with thousands of twinkling lights to a bustling mid-day metropolis - in a matter of minutes. Through the use of theatrical lighting design, a 20-minute day and night sequence has the power to transform the experience into a fully immersive miniature world. Naturally, our curiosity had us wondering - how have others accomplished such a unique lighting effect? 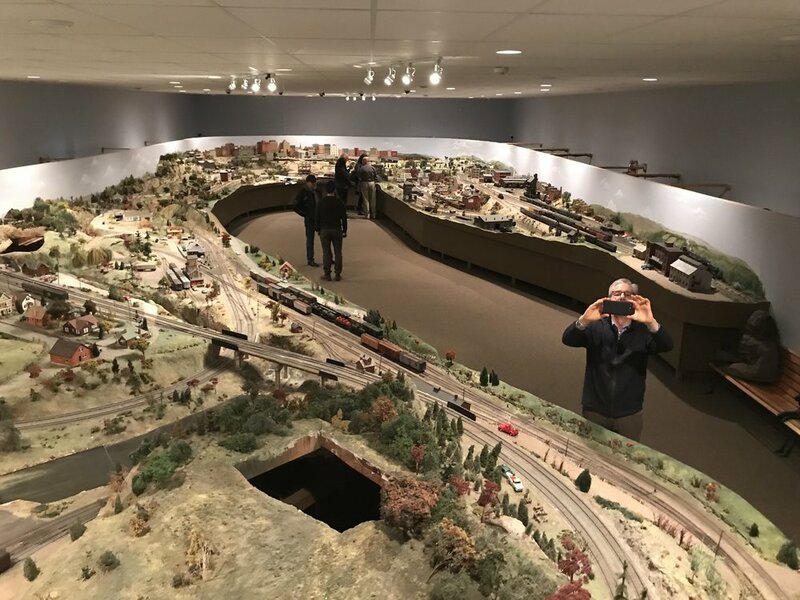 With wonder in mind, the team set off on a little field trip to a miniature world that has mastered the realistic effect of a day and night cycle and were the first to do so. St. Jacobs & Aberfoyle Model Railway is tucked away in the quaint town of St. Jacobs, Ontario. First opening its doors 47 years ago, this miniature world takes its visitors on a journey through time to the little sights of Southern Ontario in the 1950s. Check out as day turns into night, ever so subtly, in this beautiful lighting display. What might resemble a giant jigsaw puzzle is actually the physical foundation of our miniature world! Designed by David Domanski, the intricate drawings of our destinations are sent to a computer controlled cutting machine, otherwise known as a CNC router, so that they can be cut into specifically designed pieces. When assembled, the result is a strong, wooden support to hold all of our miniature world and its mini Canadians – at times, even its giants. Soon to be transformed into the sights and sounds of the Niagara region, the team took the opportunity to have some fun and pop into the frame for a team photo. A ritual of Canadian Spring is a trip to a sugar shack, where it is a joy to watch sap boil and bubble down into Canada's golden nectar, Maple Syrup. Since we're on the hunt for must-have items for our gift shop, our head of business development, John Phillipson, jumped at an invite from Paul and Karin West to visit their sugar shack.